Ellen: I just want to know one simple thing: when do I get to become an islander? Fortunately, New England isn’t like that. If you love it here, if you’re willing to plant roots here, then you’re from here. Case closed. Chef Jeremy Sewall, co-owner and Executive Chef of Island Creek Oyster Bar, was born in upstate New York, but having spent summers in Maine and with Atlantic lobsterman blood in his veins, he is a New Englander at heart. I had the opportunity to interview Chef Jeremy about his love of food, the success of his restaurants, and what food memory he cherishes. Foodie Journalist: How did you first get your start in the food industry? Jeremy Sewall: Growing up, my parents owned a small café in upstate New York that was open on weekends. At a young age I was able to experience the restaurant business first hand. I got to wash dishes and learn how to make French fries, I was immediately hooked. The café was what really jump started my interest in the food industry. I also spent summers up in Maine with my extended family. There, I gained an appreciation in getting food directly from the source – we ate local seafood all summer, often the fish, lobster and clams were hauled up by my own family members. It left such an impression on me that I now feature my grandmother’s lobster roll recipe on the Island Creek Oyster Bar menu – Ethel’s Lobster Roll. Ethel “Babe” Sewall was my grandmother and a great cook. She was married to a lobsterman (my grandfather) for almost fifty years. I don’t think she ever got sick of cooking lobsters. I certainly never got sick of eating them. Lobster rolls were a guaranteed lunch the day after a big lobster cookout. Every house in Maine has a different recipe for this classic — my grandmother’s remains the best in my eyes. FJ: What is it about food that made you decided you wanted to do it for a living? JS: I can’t say there is any one thing. What I love about food is that it is boundless, there is always more to learn and new directions to take. I was drawn to the kitchen culture and the ability to see new things all the time. The limitless opportunity and creativity of food is what I still love about it. FJ: Island Creek Oyster Bar was recently listed the #1 Travelers’ Favorite Restaurant in Boston on TripAdvisor (#8 in the nation). What do awards like this mean to a restaurant? JS: It’s always great to have your hard work acknowledged; it’s a huge boost for the staff because we are constantly pushing them to do their absolute best and now they can see why we maintain such high standards. It also means that guests’ expectations go up. If they hear you are a favorite restaurant in Boston, you better be able to show them why. We can never get too comfortable and so we always push to maintain that same level of excellence. The restaurant was opened with a lofty goal of empowering staff and guests with a better understanding of where our food and drink comes from, and it’s very fulfilling to see that mission so widely embraced. FJ: Does it mean more to get awards that involve diners voting and rating your restaurant? JS: Any type of acknowledgment is appreciated and valued equally. Since we opened in 2010, we have been awarded the “Best Seafood” in Boston every year from both Boston magazine and the Improper Bostonian. Nonetheless, voting and rating from diners has become an important part of the dining culture as well. Multiple outlets exist that allow guest to talk or review the restaurant instantaneously, some guests are writing and posting reviews while still in the restaurant. Happy guests are a key factor to a successful restaurant and therefore it is important for us to understand their experience. Diner’s reviews are the best way for us to measure how we are doing on a regular basis. FJ: All of us have food memories. Things we look back on, maybe from when we were kids that really cemented our love of food. Do you have one you wouldn’t mind sharing? JS: This is an easy one for me. I remember years of cookouts with my extended family at my Aunt and Uncle’s house on the York River in Maine. My relatives in Maine are all lobstermen so these cookouts were packed with delicious and hearty food. My grandmother and aunt would cook lobster, steam local corn and fill us with fresh made desserts. That was a fundamental part of our summer; the food and family interaction had a big influence on me. 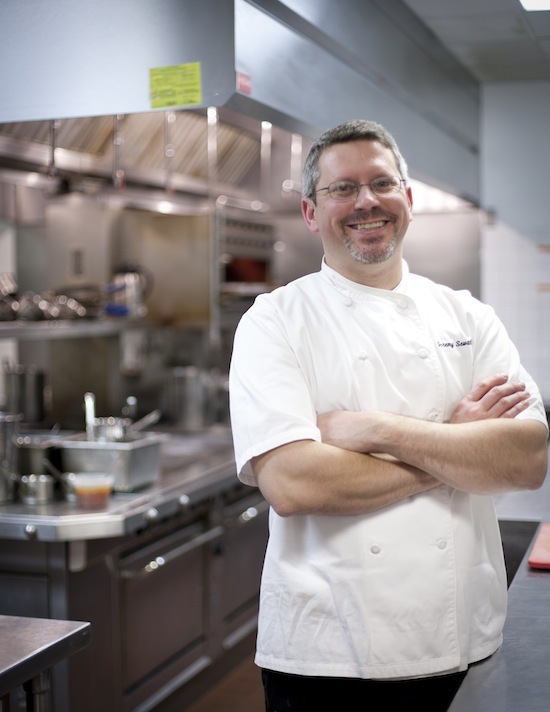 Chef Jeremy Sewall is co-owner and Executive Chef at Island Creek Oyster Bar, Executive Chef at Eastern Standard and The Hawthorne.